Obsolete type of helmet, consisting of a network of stuffed leather straps. This refers to a wheel which is radially spoked on one flange, semi-tangent on the other. For an explanation of this design, see my wheelbuilding article. With half-step gearing, the larger shifts are made with the rear derailer, and the front is for fine tuning. This allows an 8- or 10-speed set up to have a reasonable range with fairly close spacing of the gears. One downside of half-step is that it uses all possible combinations, including those that run the chain at a fairly severe angle. This was not a big deal in an 8-speed rig, but is kind of marginal for 10-speeds. Another serious disadvantage is that every other shift in the normal sequence is a double shift (front and rear derailers simultaneously). These issues are largely overcome with modern handlebar-end index shifters and narrow-spaced cassettes, but half-step requires mixing and matching sprockets these days -- no manufacturer offers an appropriate ready-made cassette. Half-step gearing is most suitable for riding in flat terrain, where shifting is rare. It allows finer gradations to get as close to the "ideal" gear for the particular wind conditions as possible, and a wide range with even spacing. Modern multi-range shift patterns use larger jumps on the chainwheels to select general ranges of gears, and fairly closely-spaced 7-or-more-speed clusters for the fine tuning. This greatly simplifies the shifting pattern, allowing constant adjustment to different grades in rolling terrain, with only occasional need for a double shift. See my Article on Gear Theory. "Handle bars" on early bicycles were actually bars of solid steel. Solid handlebars became obsolete before the end of the 19th century; all modern handle "bars" are actually tubular, but the name persists. Conventional handlebars are divided broadly into two styles: "drop" and "upright"
A cylindrical, slip-on covering for the end of a handlebar, generally made of rubber or plastic, and formed to fit the hand. handlebar grips are most commonly used for flat handlebars. However, longer and thicker handlebar grips made of stiff foam rubber may be installed on drop handlebars to improve comfort. 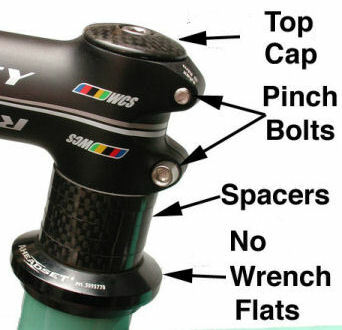 Some handlebar grips include twist shifters; see Gripshift. Cloth, plastic, leather or cork tape that is wrapped around handlebars to provide better grip and some cushioning. Most commonly used on drop handlebars. A derailer hanger is the part of a rear dropout to which the rear derailer attaches. It is also another name for an adaptor claw. A cable hanger is a bolt-on cable stop used with centerpull or cantilever brakes. The front cable hanger is secured by the headset, the rear attaches to the seatpost bolt. A chain hanger is a small braze-on mounted on the inside of the right seat stay. When the rear wheel is not installed in the frame, the chain may be routed over this fitting to keep it from flopping around. "Hanger" is also an old-fashioned American synonym for "bottom bracket." A motorcycle term for a bike which has no rear suspension. Some cyclists find this term offensive when applied to bicycles. Steel can be made to have different characteristics by various heat treating processes. These involve heating steel to various temperatures, then cooling it down either rapidly or gradually. Depending on the specific heat treatment chosen, steel may be either very hard and brittle or soft and flexible. This is a very complicated technology, with very ancient roots. For many applications, such as sprockets and bearings you want a very hard surface to the part, but the inside of the part should be treated to a lesser hardness so as to avoid excessive brittleness and breakage. The bearing assembly that connects the front fork to the frame, and permits the fork to turn for steering and balancing. 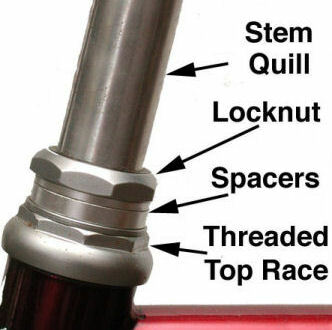 The crown race, which is pressed on to the bottom of the steerer, just above the crown. The lower head race is pressed into the bottom of the head tube. The upper head race is pressed into the top of the head tube. The adjustable race attaches to the steerer. Star fangled nut and cap, or compression rings in the case of some threadless headsets. The images below show how to identify whether a headset is threaded or threadless. Note pinch bolts on stem. Traditional threaded headsets fit forks with threaded steerers. The adjustable race screws on to the steerer, and a locknut screws on after the adjustable race to secure it. There is normally a keyed washer between the adjustable race and the locknut for extra security. Threadless headsets have an adjustable race that slips over an un-threaded steerer. If you want to replace one headset with another, you must take into account the stack height of the new headset. There are other variations, in dimensions and in how parts are sccured. . The front tube of the frame, through which the steerer passes. The length of the head tube gives a quick visual indication of frame size, because it varies more, proportionally, with frame size than any of the other tubes. The Maillard Helicomatic hub was an early version of a cassette freehub. It came with a cute little pocket-size tool that incorporated a spline wrench for the cassette lockring, a spoke wrench, and a bottle opener. The Helicomatic was a nice idea on paper, but poorly executed. These hubs are losers. Both hub flanges were 1mm farther to the left than those of a normal hub, causing increased dish in the rear wheel, and persistent spoke breakage problems. Many loyal Helicomatic fans tout the ease with which the cassette may be removed for spoke replacement as a great virtue, but if the hub were better designed, it wouldn't break so many spokes! These hubs were prone to bearing problems as well. Due to clearance requirements, they couldn't fit the normal 9 1/4" bearing balls, so they used 13 5/32 balls on the right side. These didn't hold up well. The cones tended to wear rapidly, and replacement cones are no longer available to fit these hubs. A frame design in which the seat stays don't go to the seat cluster, but rather cross outside of the seat tube a few inches below the seat cluster, then go on to be attached to the top tube a few inches forward of the seat tube. Hellenic stays were introduced by (and named for) the British frame builder Fred Helens in 1923, and have been used off-and-on since by frame builders who wish to make their frames visually distinctive. They are of no practical value, and often cause un-necessary complication in brake-cable routing, luggage-rack attachment and installation of frame pumps. The are also slightly heavier than normal frame construction. Recent users of this design include GT, Huffy and Nash bar. A protective hat. The so-called "leather hairnet" was commonly worn by bicycle racers until better designs with actual impact protection superseded it. A few cyclists, notably Dr. Eugene Gaston, medical columnist for Bicycling magazine, had taken to wearing hockey or mountaineering helmets around 1970. Club riders and racers saw the need for head protection, but there was not yet a helmet optimized for best protection compatible with a cyclist's need for light weight, unobstructed vision and ventilation. Around 1973, Mountain Safety Research introduced a modified mountaineering helmet which used cloth webbing attached by eight deformable side clips to provide impact absorption. MSR later added EPS (expanded polystyrene) foam inserts between the webbing straps. The next year, Bell introduced the Bell Biker, the first helmet designed from scratch specifically for bicycling. It used EPS as its impact-absorbing material, and had tapered ventilating inlets, as do most other bicycle helmets made since. Bicycle helmets are designed to mitigate the impacts resulting from a fall to the ground from riding height. These impacts are entirely able to cause permanent brain injury or fatalities, and account for most impacts in bicycle crashes. See also the article about helmets on this site. Dan Henry was a very influential cyclist in the 1950s and 1960s. He is most famous for the "Dan Henry Arrow" an arrow painted on the roadway with a stencil. brush or spray can, as a way of giving directions for organized rides. Many recreational bike clubs use Dan Henry arrows to mark their recommended routes. He did a lot of pioneering work on suspension designs for bicycles, and developed a bicycle seat that was based on an upside-down dropped handlebar with furniture webbing wrapped between the two straight sections. He was also known for roller demonstrations where he would perform a strip-tease (down to his shorts, then put all his clothes back on again while riding on the rollers. A very cool guy. A high gear is one in which the pedals move slowly compared to the speed of the wheels. High gears are achieved by using large chainwheels and small rear sprockets. High gears are for going fast, when the terrain permits. The rider must push much harder on the pedals in a high gear, so high gears are not suitable for lower-speed riding, due to the great strain that hard, slow pedaling puts on the joints. A fancy-sounding name for the ordinary tubing used to build cheap bicycle frames. The second-oldest style of bicycle, the successor to the "bone shaker," and the predecessor of the modern "safety" bicycle." Before the use of chain drive, bicycles had direct drive. The cranks were directly attached to the hub of the drive wheel. The larger the wheel, the farther the bicycle would move with each turn of the pedals. The diameter of the drive wheel determined the gear of the bicycle. The larger the wheel, the higher the gear. With a chain-driven "safety" bicycle, you can have any gear you want by selecting appropriate sprockets. With a high-wheel bicycle, the limiting factor is how long your legs are, because you can only pedal a wheel that is small enough for your legs to straddle and reach the pedals throughout the pedal revolution. The safety bike was first introduced on a commercial scale in 1885, and by 1893 high-wheelers were out of production -- with one exception: children's tricycles, even today, are direct descendents of the high wheele, only smaller, and with a platform with a rear wheel at either side instead of a single rear wheel..
A spring device which attaches to the seatpost and to a quick-release seatpost bolt. It allows the rider to adjust the saddle height while riding. This was a fashionable option in the early days of mountain biking, but is no longer popular.